The current dollar and euro trends are glaringly obvious to all market players. Literally, every single trader and market player on the planet is watching these currencies. Which means we have a highly liquid trade opportunity availing itself and I have been waiting for some indicators to line up with my thesis to provide a lower-risk entry. There’s no sense positioning too early simply to have the mainframe warehouses wipe out the potential of the trade by running all the stops and igniting a sell-off. This could in turn create a short covering rally but utilizing multiple signals for entry points helps mitigate the whipsaws. Make no mistake, in the long-term anything can happen with these two currencies but senseless extrapolation across multiple time frames can often create profit-delivering opportunities. Let’s observe a series of charts before the suggestion of some simple plays. 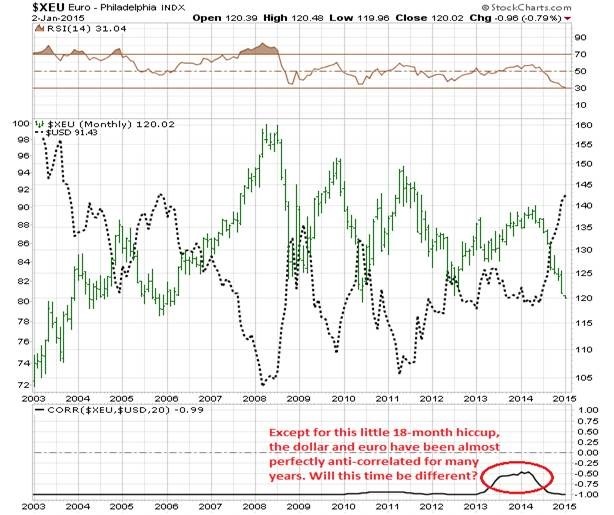 The first chart is a monthly chart of the euro going back the last 18 years. There are some simple markups on the chart. The first feature that should jump out at you is what we’ll call “The Power Line” at $1.20. This price acted as stiff resistance in the late 90’s and early 00’s (“Oh-Oh’s”), but for the last 10 years has acted as reliable support. 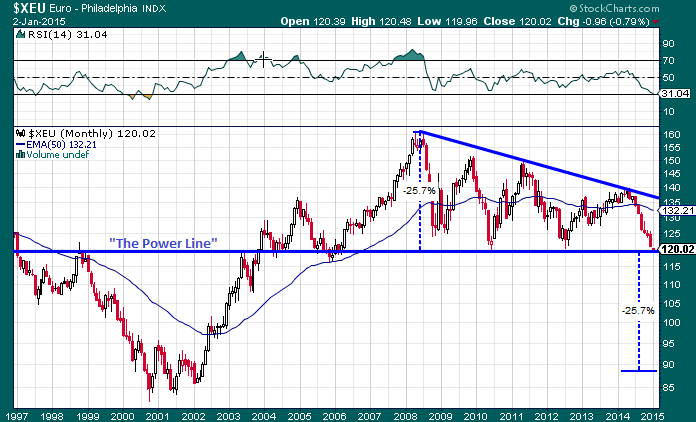 The second feature is the potentially bearish descending triangle with “The Power Line” as the base of that triangle. Now for trading purposes, I’m betting the euro bounces here again towards that upper line of the triangle. However, one can see that as this triangle plays out and should it be broken to the downside in the future, the potential target would blow well past parity with the dollar to about $0.89. But that is another story for another day. While the euro appears to be possibly setting up for a bounce off strong support, the dollar is running up against potentially strong resistance around 91 which also happens to have held for the last 10 years. This sets up a virtually perfect pair-trade between the euro and the dollar. Observe the dollar and euro’s nearly perfect negative correlation. Aside from price action, sentiment indicators also look favorable. Observe the following Optix Indexes courtesy of SentimenTrader.com. The always savvy Jason Goepfert creates sentiment indexes based on an amalgamation of surveys and various sentiment indicators and applies them to a multitude of asset classes. Below are the Optix Indexes for the euro and the USD. 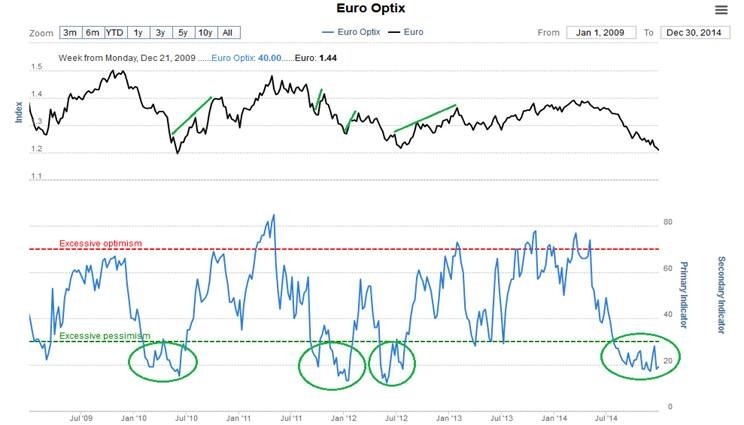 Over the last 5 years, when the euro Optix spent 4 to 6 months in the “Excessive pessimism” zone, then a countertrend usually presented itself in the short-term or intermediate term. 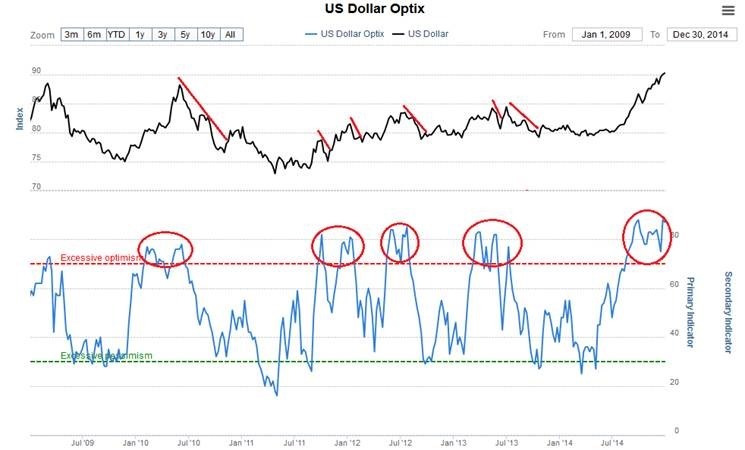 The opposite pattern can be observed in the US dollar. 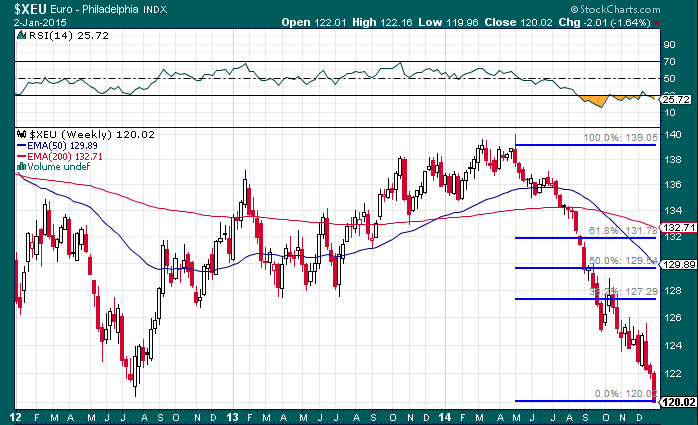 Can the dollar continue its vertical joyride? Possibly, but that would run counter to what have been some fairly reliable patterns that have held for several years now. Throw in the fact that the mainstream media continues to extol the virtues of the wondrously strong dollar and a small measure of mean reversion seems in order. If one were inclined to attempt to profit on a pair trade, there are a few simple ways to go about it. There are of course the futures contracts which are generally the realm of the professionals. If you’re an armchair speculator, you can buy some of FXE and short some UUP. You can leverage that same play with some Calls on FXE and Puts on UUP. Perhaps you want to keep things simple with some ETFs going long the euro with ULE and short the dollar with UDN. If you’re inclined, play it anyway you feel comfortable. Be especially careful with ULE as average volumes are exceptionally light. I have not positioned in a trade yet as I haven’t observed a very usable signal just yet, but we are very close. For you Fibonacci believers, here’s some potential retracements for the euro. The 38.2% retracement, assuming $1.20ish is the low, is around $1.28 which was very strong support during 2013 so this makes for a good initial profit point. The trade has all the appearances of a money-laying-in-the-corner trade as sentiment has become extended, however, if it appears too obvious then it can’t be true. Right? Not necessarily. The pattern may be delayed as a final sell-off occurs to run all the stops between $1.20 and $1.17 over the next several weeks or possibly months, so the trade set-up may require some patience. That’s the discipline in swing or position trading. If any readers choose to enter a position then good luck to you. There is a lot of doom and gloom about the euro due to the “Grexit” talk, Russian sanctions, and the ECB’s impotence amongst other things. I’m not saying to ignore any of these notions, but the charts above should hopefully spell out what the price action and sentiment are trying to communicate in light of all this bad news. I suspect the worst for the euro may already be priced into the currency, for the short-term at least. As for 2014, I hope you ended the year in style without too many tax losses and may 2015 bring some additional prosperity to your life.